The German punk band Die toten Hosen formed in Düsseldorf in the early 1980s as part of the German punk movement out the predecessor groups ZK and KFC. While the band's early music was fun and nonsensical, they began to take on political and social issues by the end of the decade, using their music to combat such social problems as racism. Their political-minded punk rock gained them increasing popularity in the alternative scene. Over time their style has also migrated from pure punk to more of a hybrid between punk and hard rock. Since the band's inception, the five members have performed several hundred concerts and have produced a myriad of albums. 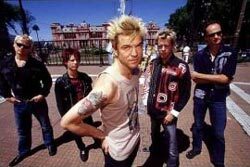 Having played concerts all over Europe and South America and in parts of Asia as well as in the US and Australia, die toten Hosen is one of the few German bands known outside of the German-speaking world. They have opened for such bands as AC/DC, U2 and the Rolling Stones and have played alongside Therapy? and Green Day. Five of their albums have made it to number 1 on the German LP charts. Their biggest hit single to date is the drinking song "Zehn kleine Jägermeister" ("10 Little Jägermeisters"), which held the number 1 spot in the German singles charts for four weeks and remained in the top 10 for a total of 13 weeks in late 1996 and early 1997. Bouts of bad luck have plagued the band since their 1000th concert in 1997: the death of a 16-year-old fan at that very concert in Düsseldorf, the collapse of the stage at a performance in Buenos Aires, the drummer's herniated disk as a result of car accident, and Campino's seriously torn ligaments that resulted in the cancellation of 70 concerts. Nonetheless, the band has been able to overcome misfortune and their 2002 Auswartespiel tour was one of their most successful ever. In July 2005, they performed at the international Live-8 festival. In September 2005, the band also performed an MTV Unplugged concert at the Burgtheater in Vienna. Punk versions of favorite Christmas carols by the Toten Hosen under the guise of their alter ego, Die roten Rosen.  Apart from meaning "dead pants", the slang expression "tote Hose" in German can mean "nothing doing" or can be used to denote that something is boring or uneventful.  Because three of the band members were named Andreas, they each took on nicknames to avoid confusion.  Over the years fans have invited the band by mail to play private parties and concerts for next to nothing. Hosts need only to pay for travel costs and sustenance and to provide a place for the band to sleep.  Die Toten Hosen, whose members are loyal fans of their home soccer team Fortuna Düsseldorf, sponsered the team between 2001 and 2003 when the club was having financial difficulties. 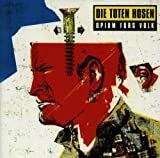 Die Toten Hosen [German] - Fan webpage with news, interviews, lyrics, more.